Expiration Date is the first book in my new cooking contest mystery series set in coastal Connecticut. The main character, Sherry, knows the ins and outs of a cooking contest kitchen but when it comes to the task of clearing her name of murderous suspicions she’s as uncomfortable as a turkey on the day before Thanksgiving. The perfect cocktail for Sherry I knew had to reflect her quirky hometown, her love of New England garden ingredients, combined with a twist because that’s the secret to how she wows the cook-off judges. 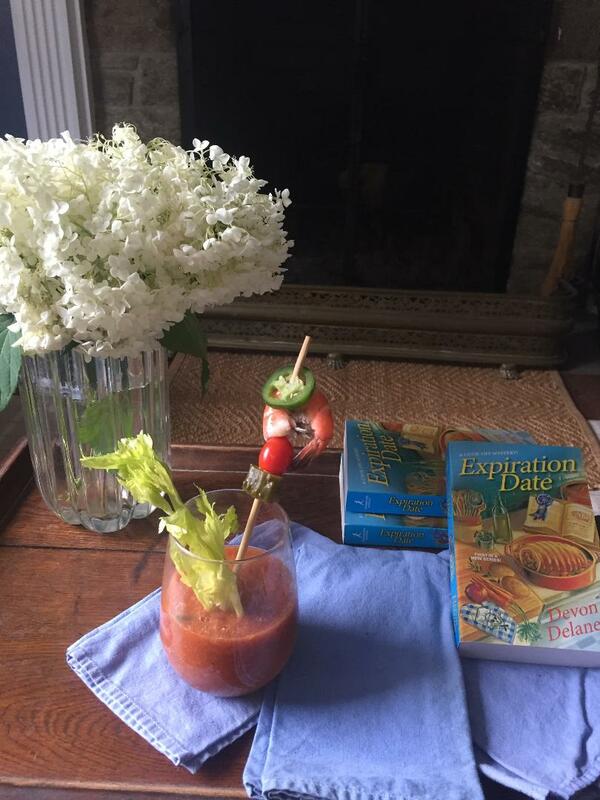 Fresh Coastal Bloody Mary is a zesty drink with a kick of spice and a hint of briny ocean breezes. In a blender, puree the tomatoes, chili sauce, vodka, ice, horseradish, clam juice and pickle juice. Pour into glasses. Garnish with shrimp, pickle slices, jalapeno slices threaded on a stick and a celery stick. During the national cook-off Sherry Frazzelle, a resident of quaint Augustin, Connecticut, is competing in a celebrity judge is murdered just before the winner is announced. Sherry is heartbroken that her beloved hobby may suffer a tarnished reputation. Not long after the ovens cool, Sherry is informed she is a prime suspect in the investigation because the last food the victim taste-tested was hers, making her tasty fare a potential murder weapon. Sherry digs deep to move cautiously forward, but a series of mishaps and obstacles trip her up while the strength of the evidence pointing to her guilt intensifies. It also becomes increasingly difficult for Sherry to identify who is friend and who is foe. Can she serve up the clues to lead the investigation in the proper direction or will someone spoil her recipe for staying off the suspect list? I won’t spoil it for you but I do know if you’ll enjoy the food, fun, and intrigue in my series. And I hope I leave the reader hungry for more.